Happy Solstice and Welcome Summer! I’m taking a sabbatical from garden design and installation work this summer —putting focus back on my primary career as painter and beginning work on a little side project— so it’s been an especially busy spring for me. With a late, wet start to the season, trying to tie up all of my planting by June 21st was a real challenge. But I am happy to say that all projects are 98% complete. You will still find me here —in fact, probably more so as I won’t be running around quite as much over the next few weeks. I hope you are looking forward to summer as much as I am this year. Travel, long days in the garden, time for family and friends …What are your plans for the sweetest season? Will This be the Year I Swing More in My Hammock? Definitely! § 6 Responses to Welcome Summer Solstice"
Happy Solstice to you Michaela! I am SO excited to hear that you’re taking time – don’t get me wrong; the many fine examples of your garden artistry are testimony to your design talent (sorry to make you blush; ) but it is so soul-filling to take the time to follow your heart. As for the flowers …I was playing with iPhone Apps and filters with these little images, so they aren’t as crisp as images made with the DSLR. 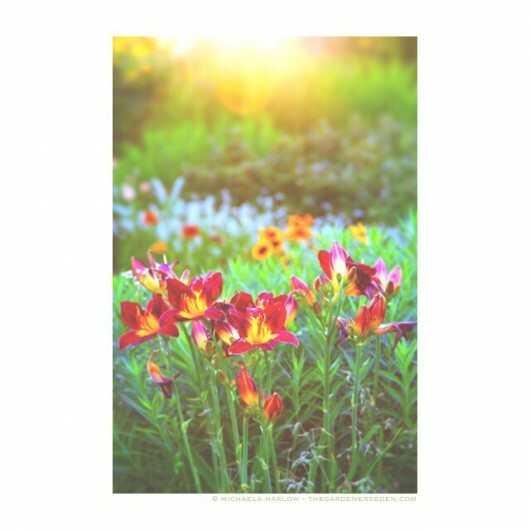 Top photo: the ‘Woodside Daylily Mix’ is from White Flower Farm. When the company sells the mix at a discount, they do not name the cultivars. So sadly, although I might have a couple of guesses, I can not truly confirm which cultivar I have at front and center. It is a beauty, and I think the prettiest in the bunch. Perhaps my local grower —Ollalie Daylily Gardens— can help me with a positive ID someday. 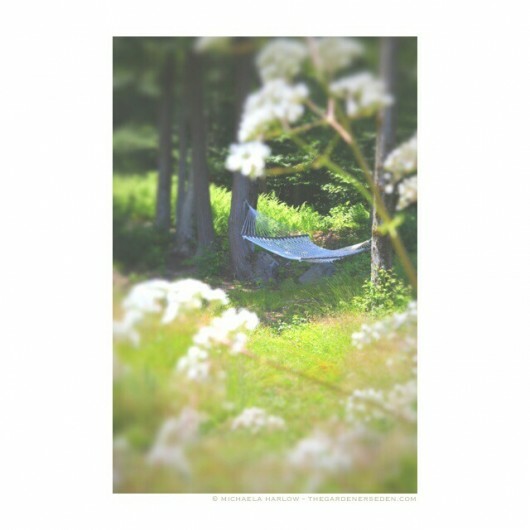 In the hammock photo, the white flowers are Valeriana offinalis. They stop at the edge of the garden, but I do catch a whiff when swinging in the trees. Hopefully, they will induce sleep. So good to hear from you, as always! You are currently reading Welcome Summer Solstice at The Gardener's Eden.